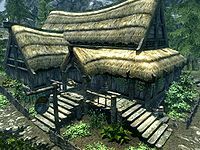 The Sleeping Giant Inn is a small inn and tavern in the town of Riverwood. It is the first building on the left-hand side coming from Whiterun. Orgnar is the innkeeper, selling food as well as several alchemy ingredients, which can be used at the alchemy lab in the corner by the door. Rooms are normally rented from Delphine. However, when Delphine is traveling elsewhere, Orgnar will rent you a room, even though his dialogue still tells you to talk to Delphine. * Leaves once Alduin's Wall is begun. Orgnar becomes innkeeper and owner. † They only appear if they were followed during Unbound. Wooden steps lead up to a covered porch at the front of the inn with several thistles, with several barrels of food around the building. You will often be able to find Stump the dog on the deck and the children living in Riverwood playing around the inn. At the rear is a small vegetable patch consisting of six potato plants, six leeks and eight cabbages growing, with a further four cabbages in a cart beside it. 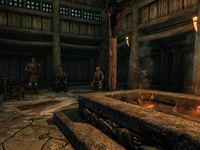 It is a typical Nord inn, with a fire pit down the middle of the common room. The L-shaped counter is at the northeast end, with five long wooden tables along the northwest and southeast walls. There are three doorways leading to bedrooms, two on the northwest side and a larger one on the southeast side. Against the northeast wall is a large vat, several food barrels, a pile of firewood and a set of shelves that hold three bottles of alto wine and five bottles of wine, with racks hanging from the ceiling in front of them. These hold ten rabbits and six pheasants, also hanging from the ceiling are two garlic braids, a bunch of dried frost mirriam and a bunch of dried elves ear. On the counter are several pieces of cheese, a salmon steak, a bottle of alto wine and a bottle of wine. Under the counter and on the floor beside it is a copy of There Be Dragons, five loose septims, an iron war axe, five more bottles of alto wine and three more bottles of wine. To the left of the doorway into the larger bedroom is a set of shelves holding several loaves of bread, two bottles of alto wine, six bottles of wine, while to the right is an alchemy lab built into a table. The long wooden tables against the walls typically hold bread and a selection of wine and alto wine. However the table in the western corner of the room also holds a selection of cheeses and two salmon steaks. The two smaller bedrooms are opposite the larger bedroom. The left-hand bedroom is the room you will be shown to if renting a room for the night and contains a single owned bed in the western corner with an unlocked chest and wardrobe at the foot of the bed and a small round wooden table and chair beside the bed. On top of the wardrobe is a copy of The Great War. On the table is a bottle of Black-Briar mead. The right-hand bedroom contains a single owned bed in the eastern corner, with an unlocked chest and dresser at the foot of the bed and a small round wooden table and chair beside it. Both of these chests contain only minor loot. The larger bedroom is Delphine's room. It contains a single owned bed coming out from the southeast wall, opposite the door with small bed-side tables on either side and a narrow table further to the right with five bottles of alto wine and a copy of Fall from Glory on top. Against the southwest wall is a wardrobe and a long wooden table and chair. On the table are four bottles of wine, an iron dagger, several red and green apples, a couple of loaves of bread and four loose septims. The wardrobe has a false back panel that opens to reveal a flight of stairs leading down to a secret room containing a central table with a map of dragon burials taken from the dragonstone you recovered for Farengar Secret-Fire from Bleak Falls Barrow and a copy of The Book of the Dragonborn on top. The room is revealed to you during the quest A Blade in the Dark). In the western corner is a alchemy lab with a potion of stamina and potion of the defender on top and a set of shelves to the left. These hold two ice wraith teeth, a salt pile, a Nordic barnacle, five slaughterfish eggs, a taproot, two bunches of tundra cotton, a potion of destruction, a potion of the warrior, a potion of stamina, a potion of minor magicka, a potion of resist fire, a potion of minor healing, a draught of health and a potion of health. To the left of the shelves is a barrel containing ingredients with a bunch of lavender, a bowl of glow dust and a giant's toe on top. Against the northwest wall are six weapon racks holding a Blades sword and several iron and steel weapons. Underneath is a quiver of steel arrows and an unlocked chest. There is an arcane enchanter against the northeast wall, while in the eastern corner is a low table and chair with a steel dagger, a copy of The Rise and Fall of the Blades, and four loose septims on the table top. There are food sacks to the right with an unlocked chest further to the right. Finally in the southern corner is a practice dummy in front of a couple of straw bales. Delphine uses the inn as a small safehouse and base of operations until the quest Alduin's Wall at which point she gives the inn to Orgnar. Sven, unlike most Bards in Skyrim does not live at the inn, preferring to live with his mother at the other end of town. All low- and medium-value items in the Inn can be freely taken after stage 10 of the quest A Blade in the Dark has been completed. This includes the items in Delphine's secret basement room. All low- and medium-value items in the Inn can be freely taken, and the beds (except Delphine's) slept in, after giving Embry a drink. Several containers in Sleeping Giant Inn are safe for long-term storage, in particular, several containers in Delphine's secret basement room that become available once A Blade in the Dark has been completed. All of the containers in the basement room except the barrel are safe for storage—namely two chests and three sacks. Therefore, the chest where your equipment is placed during Diplomatic Immunity is safe. The bed in the right guest room is no longer owned after completing A Blade in the Dark. Even if Delphine gives up ownership to Orgnar, her bed cannot be slept on. Some items placed inside the barrel next to the door to Delphine's room will be marked as owned, but will not be considered stolen if removed from the barrel. There is a failsafe built into the game, where, if your current character location cannot be loaded, your character will instead spawn in front of the bar in the Sleeping Giant Inn. This page was last modified on 27 July 2017, at 22:02.